How many times have you overslept on a morning you’re meant to wash your hair? We all know the feeling, as well as the frustration of having to face the day with greasy hair. If you’ve already discovered the miracle that is dry shampoo, you’ll know that these mornings no longer have to result in a mini panic attack. If you haven’t, however, you’re in for a treat. Dry shampoo is designed to absorb oil from the hair and the scalp, and serves as a “quick fix” to dirty or greasy-looking hair. Though it is not a long-term solution and doesn’t take the place of your regular shampoo, it works wonders if you need to freshen up your locks but don’t have time for a wash and condition. Make sure that your hair is dry – dry shampoo does not work on wet hair. 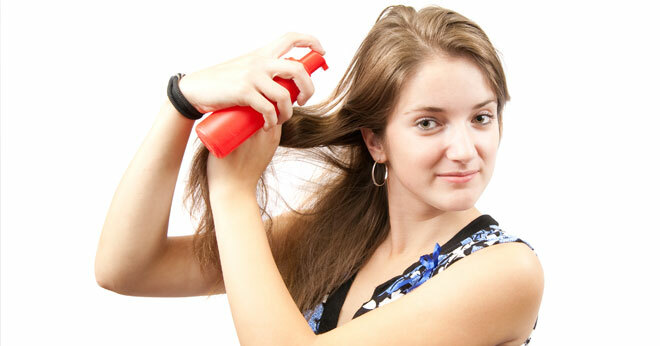 Holding the can about 15 – 20cm from your hair, spray the shampoo evenly through your locks. If you spray too closely you may end up with a build-up of product that makes your hair look even worse than when you began. You may find that you only need to use it on your roots as the ends of one’s hair seldom gets greasy. Let the product settle on your hair for a minute or two, allowing it to absorb the oil. Don’t panic if it makes your hair white – the colour will disappear during the next step. With clean hands, give your roots a vigorous rub until all traces of white residue disappears. Style your hair with your brush or comb as usual. By following these steps, you should be left with delicious-smelling and fresh-looking hair. Keep a bottle of dry shampoo at work. That way you can always freshen up your locks if you’re going out for dinner / drinks after work, or if you have to attend that important meeting right after a lunch break outside in the South Easter! My hair gets greasy quickly so these dry shampoo tips will come in handy. I will definitely follow these tips and steps next time. Lol, I have used dry shampoo before and it just made my hair dull. I see now that I haven’t been doing the steps properly. Thanks guys. Thanks I really need to try this. ESP helpful in winter for my daughters hair, I normally wash their everyday, but when it’s too cold they get a body bath and a dry shampoo, it also help untangle the hair. I am sceptical about dry shampoos. I will stick with traditional ways of washing my hair. Guess that is one of the benefits of having long hair. A very good tip to keep some of this product where one would have need of it but not have it handy at the time. I have a bottle at home that I’ve yet to use because I didn’t really know how to use it LOL, not I’ll give it a try when needed. I haven’t given it a try yet but will consider it now that I know how to use it. Great tips! Thank you & good to know how to do this. I have a bottle at home, but haven’t quite figured out how to use it, thanks! Been using dry shampoo for a long time but never knew the right tricks! Thank you for sharing. Indeed these are great tips.